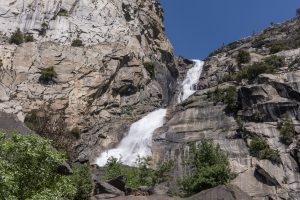 Walk along the Hetch Hetchy Reservoir to the powerful Wapama Falls as it braids out before cascading into the reservoir. 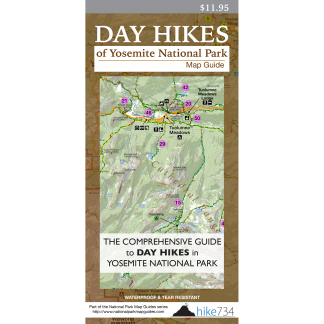 This hike begins by crossing over the O’Shaughnessy Dam with a great view of the reservoir on one side and the canyon on the other. A tunnel carved through the granite walls brings you to the trail. This follows closely along the shoreline with glimpses of Wapama Falls, while Kolana Rock prominently stands on the opposite shoreline. The trail leaves the shoreline and gains 200ft/60m passing a junction and leading to a nice overlook of the reservoir. The trail alternates between open granite and treed sections, as it traverses below the cliffs. The tall, slender Tueeulala Falls laces down the walls in the spring, but dries up in early summer. Not long after passing below this waterfall, you come to the base of Wapama Falls. The splendid waterfall splashes from high above as it cascades down the rock. Numerous small bridges cross over the falls as it spreads out into the reservoir. From here, you can see almost the entire length of the reservoir. Turn around here, or continue to Rancheria Falls (see Rancheria Falls).